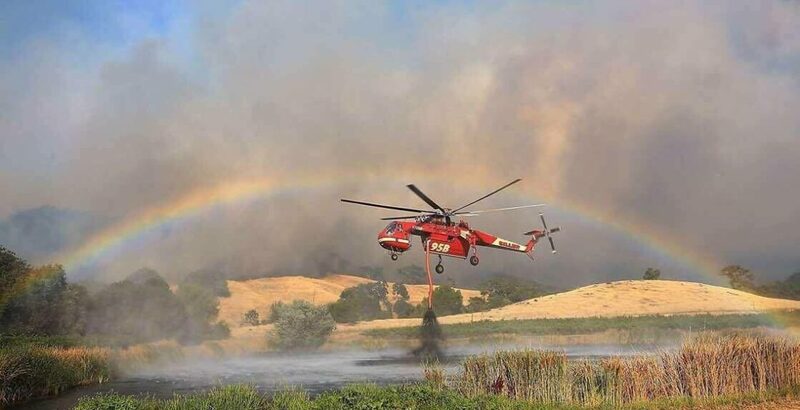 We sent out an update on the Mendocino Complex Fire and the Carr Fire on Friday. Today, we want to follow up with some information on what we’ve been doing while these fires have pushed many out of their homes. Our volunteers have been helping out at the emergency shelters, serving meals and helping distribute items as necessary. In addition to serving, we’ve been making deliveries to the shelters across Lake County. Each site has it’s own specific needs, and our goal is to meet those needs as they arise. The little things make a world of difference. Receiving deodorant when you forgot to grab it at evacuation helps. Receiving new socks, since it’s difficult to do laundry, fresh underwear, these make the trying times a little less awful. Two People we’d like to give a big mention to this week are Caleb Little and Jerry Mapes, both with Redding Christian Fellowship. They requested that we come out to do some training for church members to respond to the Carr Fire. Through this invite, we facilitated a meeting with 27 local congregations represented. This allowed collaboration and sharing of information while the fires continue. HCRN provides disaster preparedness and response training as a way to enable the body of Christ during a crisis. The Carr Fire has consumed nearly 1,000 homes, including the homes of members of Redding Christian Fellowship. Keep in mind, this is the first phase of disaster response. There are so many immediate needs to be addressed, it might be easy to miss the impact on individuals. At the end of the day, we work on people’s hearts as part of disaster recovery. As a Disaster Case Manager for NCO and a staff member of Hope City, I had the honor of working alongside a great team of volunteers from the state of Delaware to meet real time needs at two of the Lake County Evacuation Centers. Through a series of emails, phone calls and on-site visits between NCO, Hope City and Lake County Human Services, it was determined that the shelters set up in the Middletown and Lower Lake High Schools were in need of pillows, clothing, batteries , baby wipes, hair brushes, flip flops, pet leashes, hand lotion, bar soap and chapstick. Funding was secured from Churches in Sonoma county. We had a great experience shopping at the Clearlake Walmart. Nine carts later and a little over $2,200. spent, away we went to deliver the needed items. This team had come across the country to help rebuild homes, which they did, but they were also blessed with the experiences of helping serve dinner at the Twin Pines evacuation center on Monday evening, Helping load House in a Box at St. Vincent DePaul on Tuesday evening, and shopping for and delivering needed items to the evacuation centers yesterday. This is a week they will never forget. It truly is more blessed to give then to receive. Thank you to everyone who gives so much to help in this effort. I have attached pictures from our shopping excursion. Can you believe we “get” to do this? Amazing.